Does anyone know if the boarding house lunch is available for tables of 1? CrazyC wrote: Does anyone know if the boarding house lunch is available for tables of 1? I believe it is, but you don't have to be a table of 1. Just let me know when you want to go and I'd be happy to meet you for another go at it. It certainly is. I've dined solo there FWIW. My wife and I joined a friend at Big Jones last night, and while we were disappointed to learn that the fried chicken is now only available at lunchtime, we did enjoy their newest edition of the Family Dinner: Foggy Mountain Getaway, featuring recipes of 1880 Appalachia. I would definitely recommend it; for $25 bucks a head, you get three huge pots of food: soup beans, greens with pot likker, and chicken and dumplings, along with sides of sweet-n-sour beets, biscuits, pickles and corn pone (though the charm on this last item was lost on us). Each course was just packed with flavor, and overall a real treat. Dessert of "apple stack cake" was serviceable, but less successful. Our server seemed a little behind the curve, unable to answer questions about the menu and seemingly disinclined to find out and report back to us. But that did not dampen the overall experience. However, my Tasting Table newsletter this morning says Big Jones is closing for a couple of days and "will reopen on Thu., 4/26, with a new menu inspired by the historic dishes of Southern taverns and inns, plus a cocktail menu of classic New Orleans drinks". There was no indication of this last night, and no mention of it on their site today. I am of the ain't-broke-don't-fix school of thought in this regard, but I am both anxious and eager to learn what this portends. Is the border house lunch available on the weekends? fropones wrote: Is the border house lunch available on the weekends? No. They have a weekday lunch menu and a weekend brunch menu (and a dinner menu, of course). The border house lunch is on the weekday lunch menu only. Snax wrote: However, my Tasting Table newsletter this morning says Big Jones is closing for a couple of days and "will reopen on Thu., 4/26, with a new menu inspired by the historic dishes of Southern taverns and inns, plus a cocktail menu of classic New Orleans drinks". There was no indication of this last night, and no mention of it on their site today. I am of the ain't-broke-don't-fix school of thought in this regard, but I am both anxious and eager to learn what this portends. I stopped by this afternoon to drop off their GNR door sticker and they were in the midst of redoing the entire back bar to make room for more of their extensive bourbon collection which, until now, was stored three deep behnd the bar. Construction is proceeding hot and heavy and they hope to reopen by 5:30 tomorrow. It was fun having lunch at Big Jones this week with friends, including a few who were visiting from out of town. They absolutely loved it. 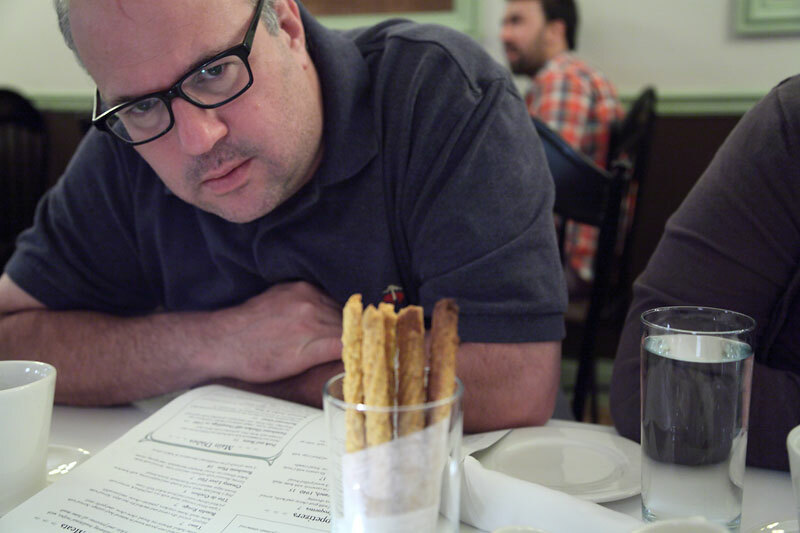 And having just returned from Charleston, SC myself, it was great to see just how well chef Fehribach's food stacked up with what I ate when I was there. Normally, the Boarding House Lunch must be ordered by everyone at the table but we ordered so many other items, the kitchen gave us a pass and let us order it for 2. That allowed us to also sample a bevy of other items from the menu . . . I love this rendition and 7 days in South Carolina never led me near one that was even close to this delicious. 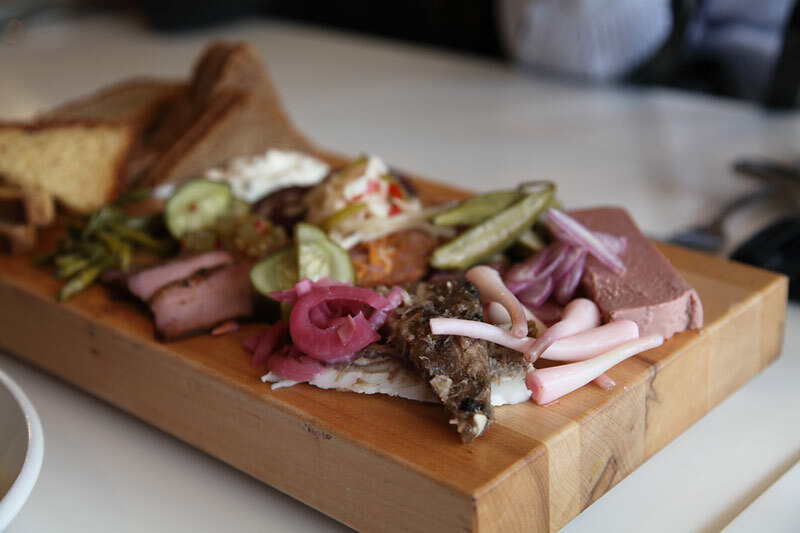 It's a shame that Big Jones' charcuterie program doesn't get more attention because it's really sensational. In a town where this craft has been exploding, the items being made in this kitchen are top tier. The tete de cochon had some very assertive touches, including whole black peppercorns, which initially had me a bit nervous. I should have known better. They were masterfully incorporated and when chewed whole, they accented the rich, fatty pork perfectly. Everything else on this platter was excellent, too, including the widely varying pickles, which each had a very distinctive flavor and texture. 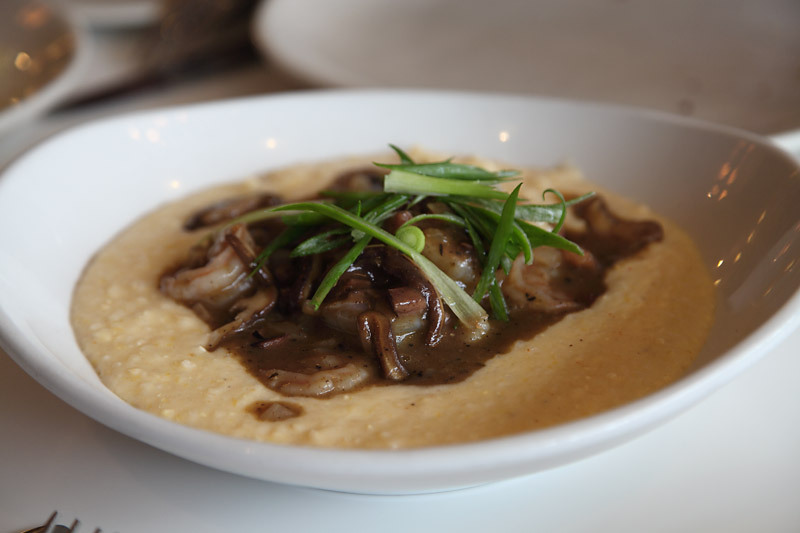 These meaty planks of shroom were incredibly tasty, especially with the rich gravy, which incorporated grits. 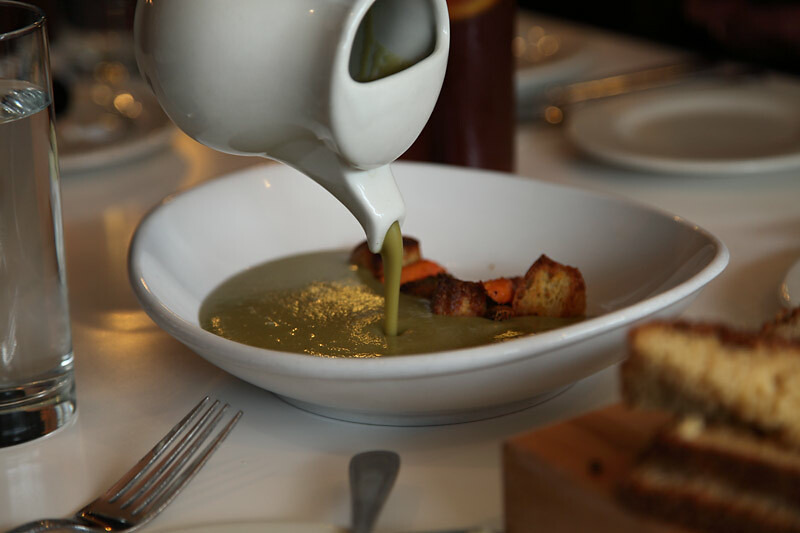 I'm a split pea soup fiend and we almost didn't order this because sharing soup 5 ways can be a drag. But I couldn't resist it and without even being asked, our server very kindly brought us out 5 small bowls, so we could split it. Wow! Am I glad we got to try this. It was one of the very best renditions I can ever remember having. The depth of flavor was amazing. It was smokey from the ham, and the ramps were just perfect. The creamy texture was amazing, and the cornbread croutons were a great addition. I loved this rendition for a number of reasons. First of all, the shrimp were tender, plump and snappy, which immediately reminded me of how they're cooked in Charleston -- properly! 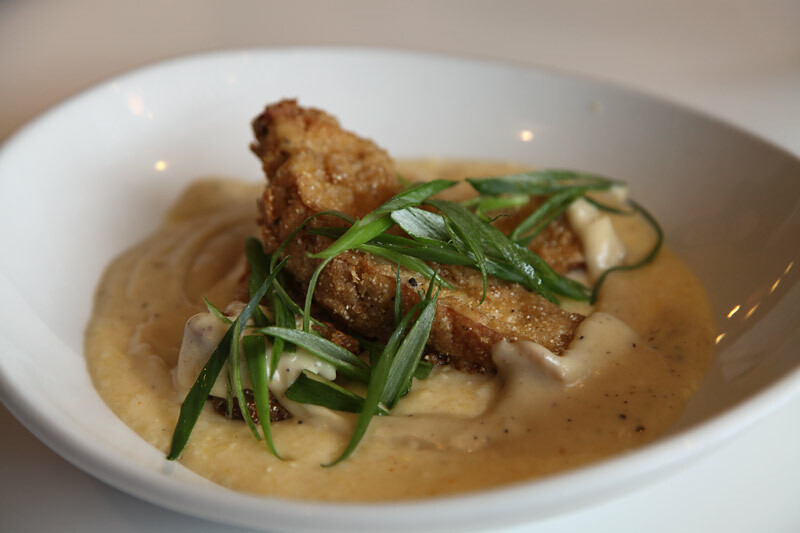 I also loved the rich gravy and the perfectly tender and aromatic grits. A great dish. This was plenty tasty but it was competing with a lot other great plates. I definitely liked it but compared to a couple of other items that were in front of me, it was hard to really focus on it. Still, on the right day, I could go into Big Jones, order this and be very happy. 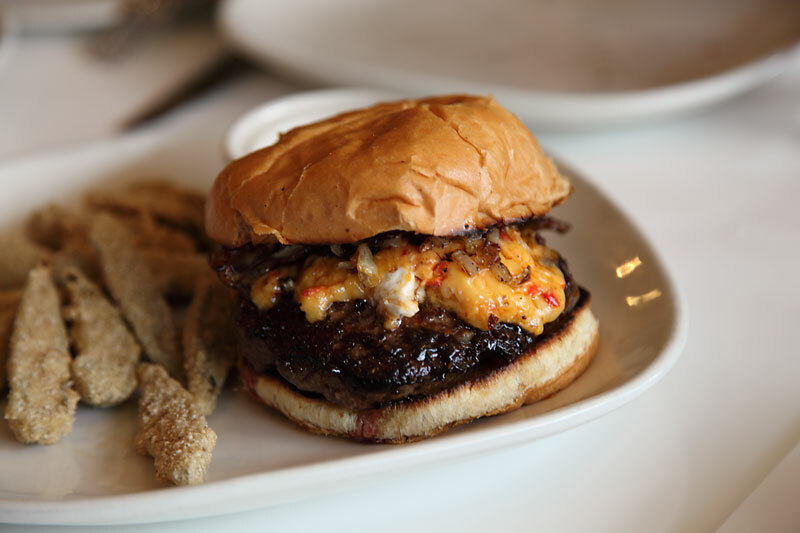 I've got to give a big tip of the cap to LTHer MarlaCollins'Husband, who not only tipped us off to this outstanding burger upthread, but also recommended ordering it with the pimento cheese spread. Spec-frigging-tacular! This burger, which was cooked perfectly to medium-rare (grilled over pecan wood fire), is going to haunt my dreams for a while. And those perfectly fried slices of house-pickled okra were excellent, too. Crispy, juicy and utterly delicious. I think I enjoyed it more this time than on my previous visit. I loved these last time and the same was true this time around. These greens are, without question, the best I've ever had in Chicago and they were far better than any greens I had in South Carolina. Really excellent rendition . . . not only really delicious but crispy on the edges and tender in the center. I usually don't like these but as full as I was, I couldn't stop eating them. We also had some vanilla bean ice cream and smoked buttermilk ice cream. The former, I loved. The latter, well, let's just say I'm glad I tried it. What a spectacular lunch. I'd been hanging out and eating with my visiting friends for 4 days and this was our final meal together. What a way to end it. You'd think that after that many days we'd all be sick of eating. Instead, the lunch at Big Jones was entirely compelling and absolutely delicious. And it was very cool to see their new GNR sticker on the front door and the GNR poster on the wall in the men's room! 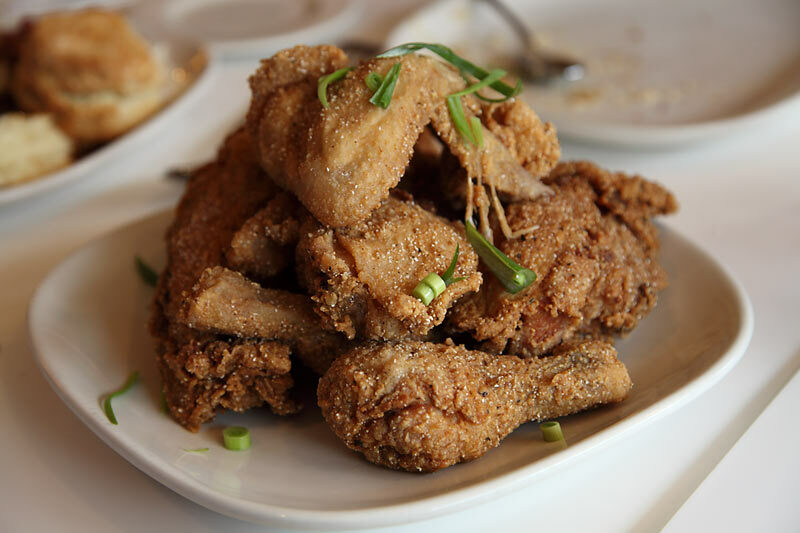 Is that cornmeal on the fried chicken ? pairs4life wrote: Is that cornmeal on the fried chicken ? There is some cornmeal in the breading, but there are some other things, too. It's pretty complex, for fried chicken. walter wade wrote: Where is Big Jones? As posted by Gypsy Boy in the opening post of this thread . . . Anyone had their fried chicken?? Read the thread, my friend. Big Jones continues to get it done! We had dinner there Friday night & had a great meal. Side note - Ronnie, your pics upstream are fantastic! We started with the tete de cochon from the butcher's block - a dish we've had before that is not to be missed. Next up, the Deviled Crab - a cast iron dish heaping with crab and a shallot & white wine accented bubbling cream sauce. I believe this is a recent addition to the menu and is not for the faint of heart. It is decadently rich while still maintaining a strong crabby character. Really outstanding. For the main, we shared the crawfish etouffee, which is also a new item on the menu, and is hands down the best rendition I've ever tried. Large, flavorful pieces of crawfish in a rich sauce. We rounded this rich course out with the new potatoes & watercress salad. Despite being full to the point of total discomfort, we went for dessert, as I had seen on either twitter or facebook that strawberry shortcake was available, and I insisted. Darren had never had a biscuit-style shortcake before and was exceedingly impressed. We went the cocktail route for the whole meal and as always, they were great. One thing I love about the menu are all of the different ways you can put a meal together. Like many of us out there, we're apt to order a variety of dishes and love when we're not constrained to appetizers - two entrees. Really interesting blog post by Chef Paul on their website. It appears they want to move more away from fine dining and try to be more approachable. We are moving away from formal table service to a more casual spirit – that is to say, you decide how you’d like us to serve you. One thing we often heard was some folks don’t like to come on weeknights because they would feel committed to a multi-course dinner and who has time for that on a Wednesday? All of our menus are now formatted so you can set your table the way you want – a quick and easy supper, a table of plates to share with friends, or a longer, more involved dining experience. We call this American table service – it’s not up to you to conform to our service style, it’s up for us to provide you with what you want. We know you work hard day to day and you are usually looking for an easygoing, casual dining experience and we’re here to provide that, service to our usual high standards with you calling the shots. What does that even mean? These types of loose menu structures sound great in theory, but do customers actually want that? I think Perennial Virant tried to get away with this sort of thing when it opened and I thought it was a major distraction. They've changed their menu back to a more traditional format and, IMO, the restaurant has improved significantly as a result. fropones wrote: Really interesting blog post by Chef Paul on their website. It appears they want to move more away from fine dining and try to be more approachable. Thanks for posting this very interesting post. Paul talked a bit about this at the LTH GNR Awards dinner also, so it was nice to read a more detailed account of his plans. I think it just means that you don't have to do the usual appetizer, entree, dessert. I went with my parents last week and we had a great meal with the boudin fritters (and complimentary corn muffins) to start, my parents split the burger and I had a chicken friend steak and we split some great, smoky grilled asparagus. I think the menu is set up to be flexible if you want to come in and have some appetizers, snacks and charcuterie, they seem comfortable with that. They have separate snack and appetizer sections on the menu. I enjoyed it since my parents don't eat as much as I do, but often enjoy tastes of a variety of things. And we spent a little over $20/person which felt like a really good value. It was pretty empty when we went last Tuesday, so I think they're just looking to make going out on a weeknight less of a $35/person just for food type proposition. They've got good drinks (and now tap beer), so it can easily get to $60 which is a bit much for a weeknight dinner sometimes. I don't think this change will be as noticeable as the others (at least I didn't notice it much when I was there the other day). The menu is still broken down into traditional sections. I think the main change that I notice is that the entrees top out at $17 and they are all more casual dishes. They used to have a wider range of prices and a mixture of casual and more elaborately plated dishes. The latter are gone. Ok, that makes sense. The brunch seemed very casual to me. I just hope they don't wind up with a menu that requires a lot of server explanation ("for 3 people I'd recommend 4-7 plates, some are bigger than others so you may need less, but if you're really hungry you should order more"...ugh). That's a trend I'm growing tired of. The other night we also sampled some of Big Jones' new punches (i.e. drinks, not licks), which were excellent. We went to Big Jones for my birthday recently. I had the simple salad to start while Mr. X had the soup of the day. (lentil?) The salad was simple but fresh with quality ingredients. I know we liked the soup, whatever it was. I loved the crawfish etoufee dish. Mr. X had the chicken and dumplings. I thought the dumplings were too hard, but the dish was really flavorful. For dessert, we split the Meyer Lemon tart. Not too heavy, a perfect finish. It was served warm, which surprised me. We have liked Big Jones from the beginning. With the new menu, I hope we can get there more often. The newly remodeled bar at Big Jones is a very comfortable space to spend time. Their American whiskey selection is vast (easily more than 60 by my casual count) and the cocktail list now includes a variety of house-made punches. Their Bourbon Society offers a fun incentive (as if one is needed) to try a variety of takes on the classic spirit. Upon joining, one receives a tri-fold pocket card (aka a passport) listing 46 different whiskeys on it. When you try one, you get a stamp. Once your passport is complete, you're given status of Master Taster and win a ticket to a special all-out whiskey dinner, which is only available to Master Tasters. There are other benefits, too, including monthly complimentary pours of the selection of the month. It's fun. During my most recent visit, a friend and I sat at the bar, tried several whiskeys and ordered some cheese straws that were absolutely sensational. We were also sent out an order of their stellar corn bread. We really wanted to stay for dinner but had another obligation. The aromas coming out of the kitchen were hard to resist and we were disappointed that we had to leave. I'll definitely be back for dinner soon . . . and I still need to try brunch. Chatting with chef Paul is always a treat. He couldn't stay long, as he had to get back to work but even during our brief visit, his passion and dedication came shining through. I always learn something when I chat with him. He's a 'student of the game' like almost no one else I can think of and his restaurant really reflects it. ronnie_suburban wrote: During my most recent visit, a friend and I sat at the bar, tried several whiskeys and ordered some cheese straws that were absolutely sensational . . . I'll definitely be back for dinner soon . . . and I still need to try brunch. Still haven't been for brunch but I was back for a very enjoyable dinner a couple of weeks ago at which we ordered the cheese straws again. They've become one of my favorite snacks in town and . . . they're Pigmon-approved. Finally made it over for the Boarding House Lunch today with the wife and friends. Everyone really enjoyed the meal and, as has been posted previously, wondered what was in the fried chicken breading which was outstanding and very different. The waiter's response to the question was similar to ronnie_suburban's previous post - some cornmeal and a variety of flours. This is one of the best meals of this type I've had, beaten only, IMHO, by Mrs. Wilkes in Savannah, GA. Although not a big fan of greens other than those served at the now closed Big Ed's BBQ in North Chicago which were on the sweet side, I found Big Jones' more vinegary mixture of kale and collards excellent. "Call any vegetable...and the chances are good the vegetable will respond to you." I had become convinced that I would not be able to make it over for the boarding house lunch, but luckily took the day off Friday and headed over there with a friend. I have to say that it was my favorite meal ever at Big Jones - everything was terrific, and with plenty of leftovers (way too much food!). 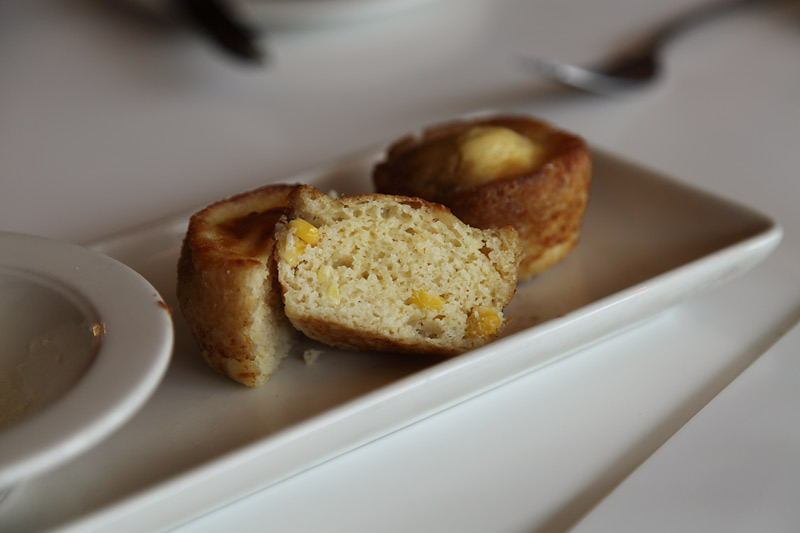 Most have probably had their terrific corn muffins, but the biscuits were also outstanding - crisp, yet flaky, moist and buttery at the same time. 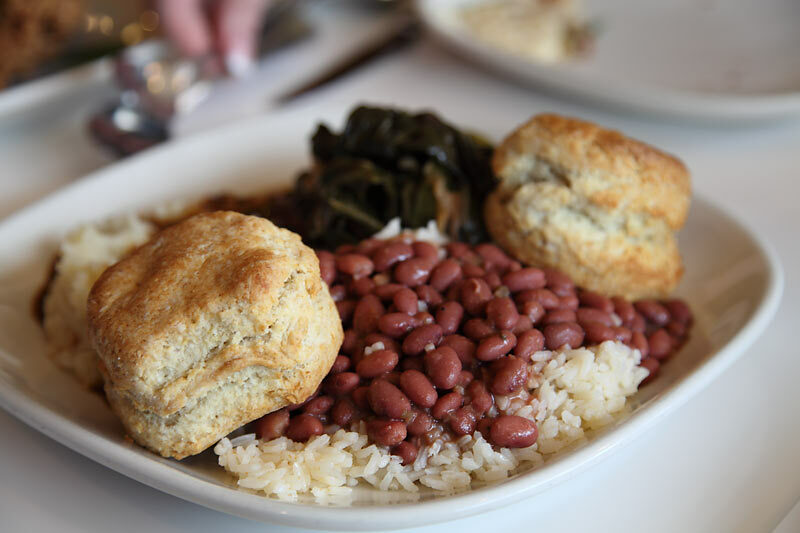 Now I'll say that I prefer the biscuits at Bang Bang Pie, but that's not a criticism of Big Jones' biscuits because BB's biscuits are simply out of this world. The biscuits at Big Jones might have been the best flaky biscuits I've tried however. I also thought the accompanying greens, red beans and rice and mashed potatoes were all outstanding (I kept going back and forth on which one was my favorite). 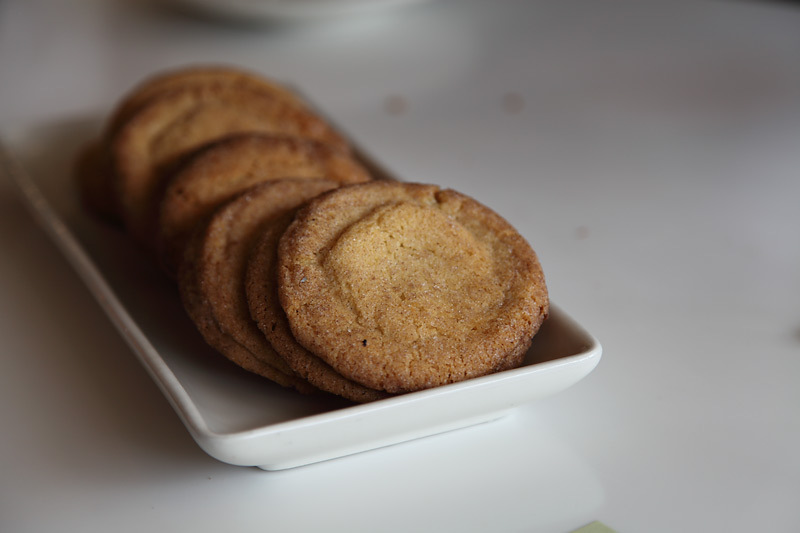 And the snickerdoodles were a nice, simple finish for such a huge meal. Interestingly, I very much enjoyed the fried chicken, but it was the sum of the parts of the meal that made this such an outstanding lunch and not just the chicken. If I'm going to complain, it's that I think they should offer the fried chicken as a meal on Monday nights too . . . or maybe at least a night or two a month. I imagine there are plenty of people like me that had not made it over there because they just can't take time off for lunch, and this is a meal at Big Jones that really must be experienced - it's that good. We tried to have a light lunch here last week, knowing that Next - Sicily was later on that night. We shared the pickles, charcuterie, and two sandwiches. I adored the pickle plate, which contained pickled ramps, radish seed pods, okra, fiddleheads, cucumber, red onion, green strawberries, beets, and chow chow. The pickled ramps were excellent and the pickled green strawberries were delicious and quite surprising. We also shared their boucherie plate with boudin noir, pate, headcheese, andouille sausage, and their tasso. My favorites were the headcheese and pate. Yum! They do have a nice in-house charcuterie program that I don't hear much about/enough about. 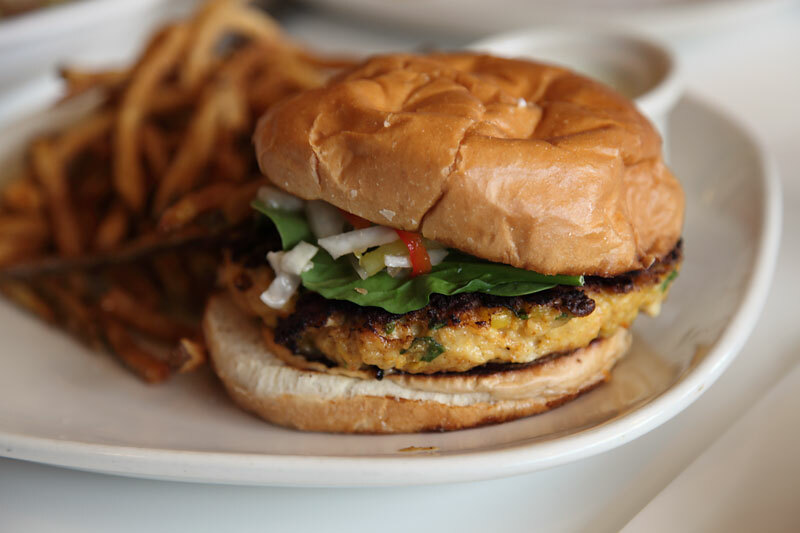 For mains, I had the shrimp burger with chow chow and spicy mayonnaise, which fell apart immediately, but was spicy and delicious, and filled with a generous amount of shrimp. The voodoo greens were a little too acidic for me (but this style of side usually is) but I was surprised to see big, meaty chunks of pork in there, rather than the token tiny bits of bacon here and there. My husband got the pork shoulder with tart mustard sauce, which was also excellent and had both nice flavor and good texture (not too fine). A very satisfactory lunch, and I look forward to returning to try some of their other dishes, like the boarding house lunch special. I think I understand all the accolades now! Just saw on their facebook about Dinner on the Grounds, ca. 1913 with Koval Distillery. I've seen them advertise one of these whiskey dinners before but didn't have the opportunity to go. Has anyone been to one and can comment on them?